Today was a perfect example of a fine Autumn day. Clear blue sky, pale gold sunshine. It was, I'm assured, cold. I don't have personal data as it looked cold, so I didn't leave the office. All those who went to meetings or to fetch lunch came back complaining it was cold. I retorted it was colder in Scotland, where a colleague in Edinburgh told me it was minus figures. In London it just felt like sub-zero. If this is your kind of Autumn weather, enjoy it while it lasts. The reliable weather app (I have four to make comparison from) says it is going to rain, and become slightly warmer. 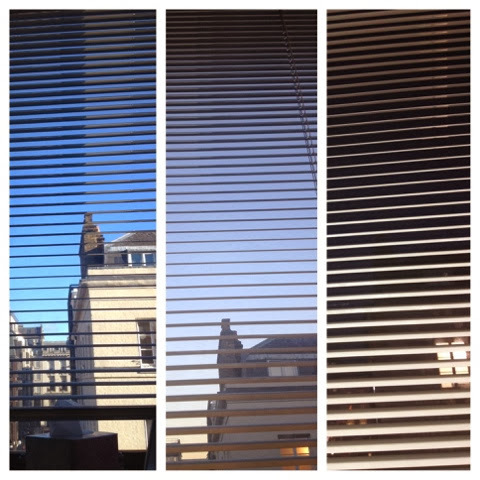 Out of my office window today, the last two about half an hour apart. Fast falls the eventide!